It’s safe to say 2018 was a pretty good year for PC games, so it falls to 2019 to step up to the plate and serve up an even better lineup of must-play titles for your gaming laptop or desktop. And there’s just so much to look forward to. Rage 2, Gears 5 and Metro Exodus will be giving shooters their due in the months to come, while The Division 2, Anthem and Skull & Bones will aim to raise the bar for the world of online play. Of all the IP Bethesda could have been revealed in 2018, no one was expecting a sequel to the mostly disappointing 2010 open-world shooter, Rage. But with id Software now co-developing with Just Cause and Mad Max developer Avalanche Software, it did just that. And you can really tell developmental duties are now in the hands of the Swedish outfit, with a new focus on over-the-top destruction and creative shooter/vehicle shenanigans. Rage 2 is a single-player focused experience, with big guns, even bigger buggies and the kind of physics-driven destruction you’d expect from the makers of Just Cause. With a splash of vibrant color it does look very Borderlands, but who’s to say that’s a bad thing? After two previous forays into the technology-driven future, Blue Byte’s grand city-building simulation series dials back the clock for Anno 1800. The seventh entry in the franchise uses the catalyst that was the Industrial Revolution to drive its engineering mechanics and oceanic combat models. The result is one of the deepest instalments yet, with a return to the pure city-building blueprint that made the early Annos so enjoyable. AI opponents will now build and launch offensives on the same map, seasons will change (which will affect your citizens and battles), while an improved trade system and the incredibly helpful ‘Blueprinting’ setup will enable you to plan out your city designs more effectively. With the commercial and critical failure of Mass Effect Andromeda now firmly behind it – and the next mainline Dragon Age entry in development but likely far from release – Canadian developer Bioware is pouring all its efforts in the co-operative open-world RPG that is Anthem. It’s a third-person shooter where you control a Freelancer, a jet-pack-wielding explorer sent out to search for resources in a dangerous new world. You play with up to three other players, and you can customise and enhance your exosuit – known as a Javelin – as you progress. With a jetpack for flight and improved movement, and dynamic weather patterns that drastically affect the world around you, Anthem promises to be an engaging – if not entirely original – new IP. While the X-COM series has enjoyed something of a return to form in recent years, one of its co-creators has created a new spiritual successor in the form of Phoenix Point. Snapshot Games’ turn-based strategy title also uses an alien invasion as the backdrop for its action, although these extraterrestrials have definitely taken a few genetic leaves out of a HP Lovecraft book. The result is something that doffs its cap at X-COM while attempting to do something a little different. Alien armies will mutate and evolve in response to your tactics, forcing you to adapt your approach to each new skirmish. By using an open-world, you’ll need to compete with other AI-controlled factions for resources, adding a constant need to re-evaluate your position in the war. Despite some considerable delays – and a few launch issues – The Division (much like most of Ubisoft’s online efforts in the long term) grew into an engrossing experience with a consistent post-launch content map and a really enjoyable PvP mode. Developer Massive is back for the sequel, with the action moving from Manhattan to Washington DC. The United States is still devastated by a viral infection that crippled the population during Black Friday, with survivors forced into a civil war against gangs of marauders. As a member of The Division, you and squad of three other players will take on AI gangs, search for new gear, join in Destiny 2-style raids and more. Gears of War 4 wasn’t quite the series refresh that developer The Coalition promised it to be, but then again, the Gears formula became the third-person shooter template for a reason. It works, so why mess with that formula too much? Gears 5 shifts the narrative’s focus to Kait Diaz (who served as an AI companion in the previous game, although the story really centered around her character) so this change certainly makes sense for the sequel. As with previous entries in the series, expect over-the-top vehicle sections, intense cover-based battles and a handful of those towering bosses Gears loves to throw at you. Alongside the single-player campaign, you’ll also be able to play that moreish multiplayer locally via splitscreen and in the usual online lobbies. It’s been quite a while since 4A Games’ post-apocalyptic shooter/survival horror series last made an irradiated splash on PC – almost six years, in fact – but the wait is almost over. Metro Exodus has used that time wisely it seems, with a mixture of those familiar claustrophobic tunnels paired with a new focus on sandbox exploration on the surface. That larger environment means you can explore the devastated Russian landscape and build and enhance new weapons, employ stealth to outwit mutants and fellow survivors and attempt to survive a dynamic weather system that makes every trip topside even more dangerous. 2013’s Metro: Last Light was a triumph, so we hope the third instalment does the series justice. We all suspected that Ubisoft would eventually take the most popular element of 2013’s Assassin’s Creed IV: Black Flag – that glorious open-ocean sailing and naval combat – and spin it into its own game. We just didn’t think it would take six years for said new IP to finally raise anchor and make itself known. 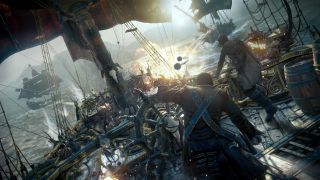 Skull & Bones is the result, and a third-person sandbox where players inhabit the same online ocean and can raid AI-controlled ships or attack one another for their piratical plunder. Following an extended romp through the fantastical wilds of the Warhammer franchise, The Creative Assembly is returning to the historical wing of the franchise that placed it firmly on the real-time strategy map with Total War: Three Kingdoms. Set during the titular period in China’s history where multiple factions fought for control of the vast nation, Three Kingdoms will see more of that moreish Total War action – with hundreds of infantry and cavalry battling on screen at once. There’s also a new social system that enables you to form alliances with other factions (which can be both a blessing or a curse if your diplomatic skills need some work). No 2019 preview would be complete without mentioning one of the most anticipated games of all time. Save Half-Life 3, no other game has been asked for – nay, demanded – as much as Shenmue III and after a surprise reveal at E3 2015, a crowdfunding campaign and lots of delays, 2019 should be the year we finally get to play as Ryo again. Series co-director Yu Suzuki promises the biggest and most impressive entry in the open-world series yet, with more hand-to-hand combat, beautiful ’80s-set Chinese vistas and all the mundane side-quests you could ever ask for.